I have a problem. And it starts with a B. Yep, you guessed it. Barred Owl. It was a long time before I managed to get a shot of a wild Barred. Many people would consider it a pretty common owl to see. Well, not for me. Great Horned Owl? ✅ Check. Eastern Screech Owl? ✅ Check. Barred Owls? 👎 Nope. It's funny, I’d gone to look for a Snowy Owl many more times. But their numbers are few and they are only around in winter, so it's understandable not tracking one down. Barred Owls never leave... they hide. And so the cycle repeated... another day, another tip, another failed sighting. “Barred was seen last night if you want to check it out in the morning.” Another faithful buddy trying to help me finally get a glimpse of this bird. 😳 I'M DOWN. LET'S DO IT. I woke up in darkness, drove about an hour and arrived just before sunrise. And then it rained. I DIDN’T SEE/HEAR ANYTHING ABOUT RAIN. Fantastic. Well, I was already out there, may as well look have a look around. So I started on the trail. And after a good slow look around the area...*big shock*... nothing. And then I saw him. Sitting there. Sleeping. As a couple of folks walked by their conversation didn't even make him bat an eyelash. My heart was racing, but I wanted to let them pass. I wanted to enjoy this owl and have him all to myself. They couldn’t help but notice my gigantic 600mm lens.🤦🏼‍♀️ "Are we in the way?" "No, no, it's alright," as I signaled them to walk ahead, never even noticing they walked by that beautiful creature. I looked at him for a few minutes before I could even fire the shutter. I had a moment with him. As he stood there, sleepy, I could feel a tinge of fear up my spine. My gut was talking to me... “Yea, you better take a shot before he decides to move.” GO GO GO! Fortunately for me, the sun eventually came out and the bird remained sleepy and patient. My buddy came though and we came away with a some great shots. It was an amazing morning. Finally. 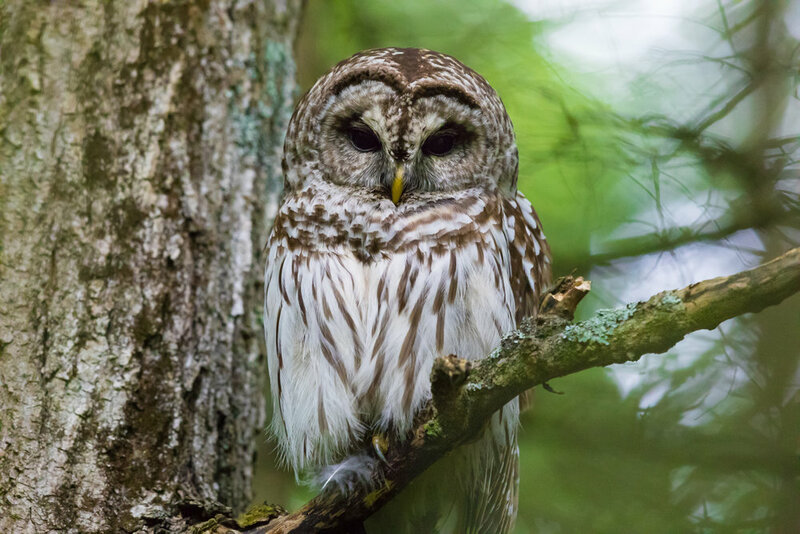 I photographed a wild Barred Owl. This is my Barred Story. I certainly got lucky a few times since, but it always seems to be a struggle finding them. I think everyone has bad days but there's something especially tricky about getting some time with Barreds. I guess I've learned to cherish those moments we've shared even more. Three. Free. Prints. Store Launch Grand Opening + Contest!